Circles, my head is going round in circles.... and it's only because this Retro key ring is so great. Make sure your keys have an Instant Party with this fab Sixties Mod The Who 'Circle Logo' Retro Key Ring. The Who silver metallic ket chain that features the classic Retro Who circles pattern and signature. A variation on the classic Sixties Mod Target, this makes for great Retro and Indie Pop Art gift idea. The stylish motif resembles the grooves on a classic 45rpm record. 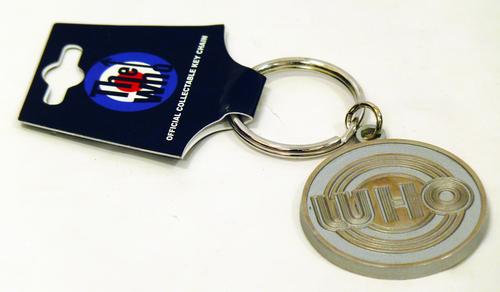 THE WHO CIRCLES LOGO RETRO SIXTIES MOD METALLIC KEY RING. THE WHO CIRCLES RETRO SIXTIES MOD METALLIC KEY RING - Silver metallic The Who key chain that features Retro circle pattern and classic Mod 'The Who' signature. The Who Circles Key Ring. SKU: The Who Circles Key Ring. THE WHO Retro Sixties Mod Metallic Circles Key Ring.